A great cry of weeping and teeth-gnashing could be heard around the globe after General Motors decided to put an end to the Pontiac brand a few years back. Of course, that also means the last several machines to roll down the line could potentially become collectors items. Does that include the 2010 Pontiac Solstice Coupe or Convertible? That's tough to say, but something of a precedent could indeed be set tonight at Barrett-Jackson as the very first and very last 2010 Solstices are going up on the auction block, sold as a pair. First up is #1 of 12 Solstice GXP Coupes built in 2010, in Kinetic blue with an interior in black leather with matching blue accents. It's also the only Heritage Coupe built with a manual transmission. Up next is the very last 2010 Solstice built (of 20 total), a Kinetic Blue Convertible. Check out both the Coupe and Convertible models' official auction pages on Barrett-Jackson, and watch Speed's live online coverage here. 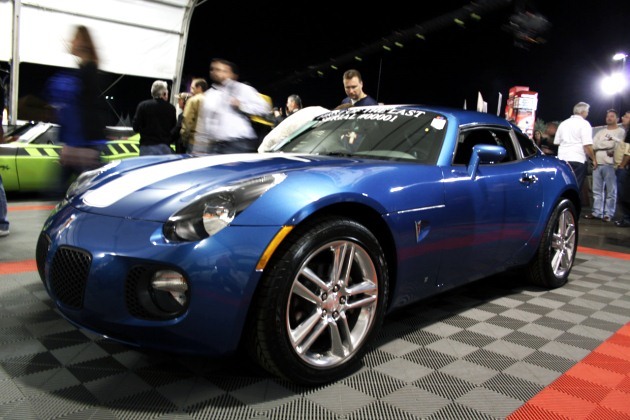 Photos copyright ©2011 Jeff Glucker/AOLBarrett-Jackson 2011: First and last 2010 Pontiac Solstice on the block originally appeared on Autoblog on Fri, 21 Jan 2011 22:55:00 EST. Please see our terms for use of feeds. I'd give my first born for a Solstice GXP Manual Coupe. Absolutely love those cars! Id give my right nut for the first one and my left one for the last one! Seriously! um, but how? didnt youre wifey take them? jk. i had too. They were really neat cars indeed! Too bad the New DeLorean thing didn't take off. Supposedly, discussions were in the works to continue those platforms outside GM. I love the hard top one, the color is just so and the stripe is !!!!!! you weigh like a buck 30 how COULDNT you fit!? a buck 50 thank you.